In the South Wales Argus yesterday was a story about the executive in Blaenau Gwent passing their bid for capital funding under the 21st Century Schools programme. In itself, there's nothing wrong with that. The deadline for each council to make their application is today, so those that hadn't finalized their bids needed to put them together quickly. But the exercise does have a certain degree of unreality. The BBC have collected information from a lot of the local authorities, and many of them are putting in bids that are way above anything the Welsh Government will be able to fund given the severe cutback in the Welsh block grant. They report the total so far as £2.86bn, of which £905m is for the three years from 2012 to 2015. Only about half that money is now likely to be available. Blaenau Gwent council's first proposed phase, Band A costing £23.5 million and scheduled for 2012 to 2014, includes a £10 million refurbishment and remodelling of Abertillery Comprehensive School. 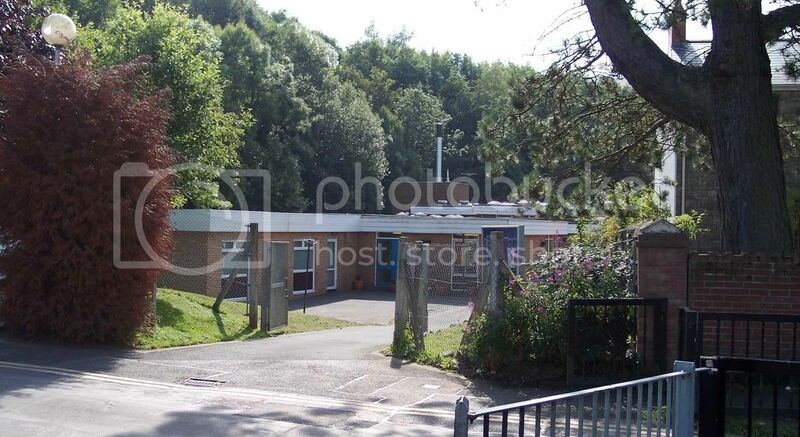 It also includes £7 million to remodel and address surplus pupil places at Coed-y-Garn, Roseheyworth and Ystruth schools and review the catchment areas for Abertillery, Blaina and Nantyglo. Band A also includes the £500,000 clearing and removal of asbestos from the former Nantyglo Comprehensive School site, £500,000 to review regional provision of Welsh medium secondary education and transforming the Garnlydan School site into a £2.5 million base for the PROTEUS project, for children with emotional or behavioural difficulties. Band B, covering 2015 to 2017 and costing £66.5 million, includes potentially closing Tredegar Comprehensive School and a primary school in the area to make way for a new three to 16 school. It also includes building two new schools in Ebbw Vale, one in Abertillery and enlarging another Abertillery school to 420 pupils. Band C, costing £17 million and scheduled for 2018 to 2020, includes establishing two 420-place schools to replace the existing primary schools in the area and reviewing religious schools. Band D, costing £45 million and scheduled for 2021 to 2023, involves reviewing schools in Brynmawr and building a second Welsh medium school on a vacant school site. Now if the initial band of £23.5m seems rather low compared with other authorities, it is because Blaenau Gwent is getting a large tranche of funding for The Works, which will include money for a brand new 3-16 school, and the relocation of Pen y Cwm Special School as part of a new Integrated Children's Centre. The original consultation document is here. Two existing primary schools – Waunlwyd and Pont y Gof – are to be closed with their pupils transferring to the new school in September 2012. Some of the other aspects of the scheme might be problematic, but so far as primary age provision is concerned, both schools seem very eager to move to the new premises, and both are less than a mile from the site of the new school. It's a nice school ... despite its rather peculiar fenestration. Yet for reasons which made no sense to me, it was only built as a one-and-a-half form entry school with a capacity for 315 children, plus nursery. As I noted here it is already inadequate to meet the parental demand for WM education, but the council seemed to have no plans for providing a second Welsh-medium school, saying that this new school was intended to be for "the whole catchment area of Blaenau Gwent". And now, as we can see from their 21st Century Schools bid, a second WM primary is at the very bottom of their list of priorities ... something they don't intend to start building before 2021, to be ready by 2023. It doesn't take a genius to realize that with the Welsh Government only able to provide a fraction of the funding of previous years, the projects at the bottom of the list will be delayed well beyond these dates. It certainly looks like Blaenau Gwent want to kick any plans for a second WM primary into some extremely long grass. 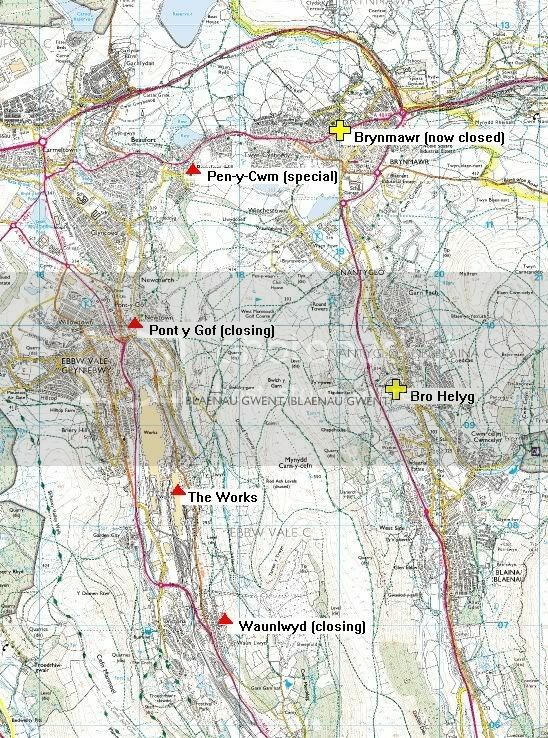 Pen y Cwm is a little further from the centre but without any transport problems. It is right next door to Beaufort Hill School. Of course it would be nice to have a brand new school building. But we don't need to have one, and economic circumstances mean that we'd be very unlikely to get one any time in the foreseeable future. So instead, I think Blaenau Gwent should be looking to set up a new WM starter class this coming September with the aim of establishing a new WM primary in either the Pen y Cwm or Pont y Gof building in September 2012. If local people want to see this happen, one way to make your views known is by completing the council's online Education Transformation Survey. The purpose of my e-mail is to advise that the Business Minister will be issuing a Written Statement over the course of the next few days and that statement will make reference to tranche 3 projects that have been approved and that these project will be deferred until financial year 2012-13. However, you will be aware that we are currently arranging meetings with Directors to discuss all transition projects including T3. Decisions on how we meet our commitments in line with budget availability will be made once those discussions have taken place. So if they can't finish Tranche 3 SBIG projects, will they really start any 21C Schools projects? I think some will get built, PG. The draft budget does set aside £173m, £161m and £144m over the next three years for capital expenditure on schools, and in some cases it will be cheaper in the longer term to build new than to keep patching up schools that are in bad condition and expensive to run. I'm most concerned that building new schools has always been seen as the easiest option for expanding WM education because it avoids the highly-charged issue of closing EM schools with surplus places. As a result of the cuts, this option is not going to be so easy. So tough decisions will need to be made. However, the funding for The Works was earmarked some time ago and is secure, therefore there will be empty school buildings which can be used to expand WM in Blaenau Gwent. It's a matter of having the political will to set up new starter schools. But Swansea, for example, just closed three schools and are, at least so far, still stubbornly refusing to set up WM starter schools in any of them ... even though the surveys they themselves commissioned show that demand is far greater than the number of WM places available. I have no doubt some will get built but which ones? Does deferring Tranche 3 SBIG projects for a year mean that Band A, 21stC schools also get deferred for a year which means they will start in April 2013 rather than 2012. I now see what you're getting at, PG ... not least after having read the post on your blog. My main concern in this post was that Blaenau Gwent had put any expansion of WM education right at the bottom of their priority list. But your point is very interesting. To me, there certainly seems to be no reason not to proceed with funding the commitments already made for SBIG/T3. In fact the draft budget shows capital expenditure for the department as a whole going up from £157m this year to £173m in 2011-12 ... but then falling to £161m and 144m in the two following years. This is one of the few instances where the figure went up rather than down, and I would have guessed that this would be to reflect the fact that these commitments had already been made. This email therefore seems very strange indeed and I, like you, will look forward to the written statement. Leighton Andrews clearly said that he would fund the tuition fee rebate by top slicing the HEFCW teaching grant; so if he is trying a back-door means of supplementing this to make his sums add up, he is going to look like a right fool.